Growing up back home in eastern Newfoundland, There were no huge malls or big box stores, instead we had locally owned stores. The names will ring bells for some, Western Tire, Stanley’s, Duffit’s, Junes, and a bit later The Chain Store, Ayres, but the granddaddy of them all for me was Cholock’s. This was a huge department store or seemed huge to a kid anyway, located near the railway tracks in downtown Clarenville. (The building later became home to the department of wildlife offices for those who may be trying to locate) I don’t recall a lot about the store per se, but what was the huge draw was ….. upstairs! …..
My memory may be foggy, as its been closed for many a year, but if I recall correctly, upstairs only opened a few weeks before Christmas, and it was full of toys, toys and more toys. It was a magical place for me, and I’m sure many other local kids. 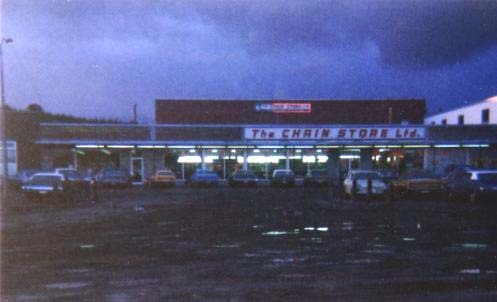 A little later on Ayre’s opened in Clarenville too, Riff’s was in that location after, followed by other places, but Ayre’s remains as a big memory. Their toy section seemed huge at Christmas time, I can’t recall if it was there all year round or not, and I’m sure it would seem small compared to today’s stores, but it was also a great place as a kid. Another one that was less well known maybe was, I believe, called Martin’s. Near Hyne’s Jewelry they sold musical instruments and I can’t remember what else. I was and am musically inept, but I was always fascinated by the things in there. We didn’t see toys all year round in stores then, or if we did, not locally. To go these stores was to start Christmas, and I look back on it fondly, and wish that some of that magic passes on to you and yours this season. Ayres was there for many years and all year long; I know because I worked there in 1974-76 as did my aunt, Marjorie Hiscock, Myra Goodyear was in the office and Mr. Gillette was the manager. I met Mr. Gillette at Piper’s in 1992-93 when we returned to Nfld and lived in St. John’s for a few years. Lots of memories for sure. OMG, Cholock`s, I remember it so well. Getting to go upstairs was a big treat. Thanks for the reminder of my younger years.